I first started teaching self-contained third grade three years ago. After spending close to 10 years in and out of classrooms, working with intervention students, and seeing some amazing teaching and learning, I knew I wanted to do math centers in my room and I knew how my math block ‘should’ look. I wanted time to meet with small groups of students, and I wanted students to have time working independently. And I hated it in action in my classroom. My math block is basically always in the afternoon because I do reading and writing in the morning as much as possible. So, the kids are a bit more tired and energetic. Maybe this is part of the reason they didn’t work for me. Maybe it’s because I’m less patient in the afternoon. Maybe it’s my fault in planning and/or execution. Either way, for a year and a half I tried various different models and groupings trying to find what worked for me. And, I couldn’t. I tried 3 centers each day in about 45 minutes and the students would rotate to the other 3 the next day. I even blogged about how I used Powerpoint to help me manage it all. While not all of them changed each day, some of them did, and it was a lot of planning and effort. This was my favorite set up, but something just felt “off” to me. I could see students in action every other day, but I struggled with what I had students do independently on the day they weren’t with me. I often had students do their independent practice while I was nearby so I could keep an eye on what they were doing. I also had a hard time with spending 45 minutes of my block (half of it essentially) all in centers. I just didn’t feel like what I had students doing during that time were meaningful enough, and warranted half of the math block. I tried just doing 1 group each day and students rotating through, but I didn’t feel like it was enough time for me to see my students working on their math skills. It wasn’t giving me enough time to work with my needy students. I tried reading every blog post I could find on Guided Math and couldn’t quite wrap my head around exactly what it should look like, and how it was different from what I was already trying to do in my room. I also couldn’t quite go with the idea that I was teaching everything in small group every day without a lot of whole class instruction. But then I found what did work for me in my math block. I split my students in half and taught my lessons twice. My kids were engaged and I was able to differentiate for them in smaller groups to meet their needs. Essentially, after our daily, introductory activities, I split the class in half and taught the lesson to both of them. However, I taught the lesson differently with both groups. Here’s a look at how our typical 90-minute math block was scheduled in this format. The beginning of our math block is *always* a story problem of the day. My first year in the classroom I quickly realized that my teaching of problem solving for a day at the end of another unit, or as a unit itself, just was not enough practice for my kids. I immediately began implementing a ” Word Problem of the Day” format and have seen the difference that it makes with my kids. We now implement it school wide and I’ve done the same structure in 1st grade and 2nd grade. Students work through the problem independently practicing their problem solving strategies independently. Every now and then I have students work in partners, or explain their work in partners. Then, we go over it as a class. I find the power in this being in students’ independent practice and oral explanations of their work as they work. I also have students identify where their mistake or misconception was to help them and others solve story problems in the future. At the beginning of the year, this takes much longer than 15 minutes, and there are days throughout the year that it takes a few minutes longer, for sure. But, I’ve learned that giving students daily practice with various levels of rigor, and spiraling through the standards, is key for my students to feel not only comfortable on their state assessments, but also confident that they can read a problem and develop a plan of attack to solve it. We use my Word Problem of the Day bundle during this time as they’re rigorous, focus beyond just correct answers and into problem solving strategies, and keep students’ fresh on all of the standards through an ongoing build and spiral. I began a number of the day routine using an outside resource with students reviewing the Number and Operations standards. We also did Number Talks based on the book. I split my class into two groups: one with the average and above average students (the kids that “get it” after they see it, or the ones who already have a ton of background knowledge); the second group is the below average and low students (with a few average students that need a bit more repeated practice to get something). Depending on my number of students at the time, the groups range from about 9-12 students. While this is higher than my group numbers when I taught in centers, I still could group the kids into smaller groups for on the fly reteaching. I taught the two groups slightly differently. For the groups, students bring their dry erase boards and markers and come and join me on the floor. This allows me to get down and see what each of them are doing throughout each step. When I would do this whole class, it was so much harder to keep tabs on everyone and circulate. This allows me to jump right in, quickly put a couple kids together to reteach, or to show something to the entire group. Students also often jump in and assist each other when someone isn’t getting it. Because we’re all sitting close together and have fewer students to wait on to finish the students stay engaged with what we’re doing. They also know that if they work hard with me, I’ll generally give them a few minutes to have free draw on their boards before they put them back. 2 minutes of drawing time does wonders! 🙂 The big differences between the way I teach my two groups is the “We do” part of our lesson. With my higher group, after a very quick two problem or so review of yesterday’s lesson, I quickly explain the new lesson and we practice a couple together. The bulk of our time is students practicing the skill on their own with me checking. I do this one problem at a time so I can clear up misconceptions right away. After the group has demonstrated mastery we often are able to take the skill to the next level: to quickly apply the next step in the standard, or even sometimes doing the next grade level’s standard for the skill. We often continue this practice as “we do” as well, but it sometimes is done independently depending on how the students are doing. Previously, I’d never been able to really push my strong students in math to apply their learning beyond our current standards. Giving them these little opportunities to try out and apply the skills at a higher level gave them confidence and helped them solidify the current standards, too. This has meant that by mid-week, group 1 has generally finished the week’s skills. When I plan, I plan out the week for group 2, and look to see where I might be able to take group 1. We often were able to reach that next level. With group 2, we spend most of the time working on the problems together. This is the group that needs additional practice, that often has previous misconceptions. We discuss the steps together and do problems step by step before I “turn them loose” to try on their own. Even when they do try it on their own, I’m still closely monitoring to see who is getting it and who is not. Often, even within just that few minutes, I’d do a quick reteaching with a small group, or the whole of the group to make sure students understand. This set up is the first time I’ve been able to feel like I can push my high students and also reach my low students who need a lot of “cleaning up”. It’s allowed me to really differentiate and meet their needs. I now follow my district curriculum much more specifically than I did previously. However, my group functions essentially the same, with students bringing a math book and pencil rather than dry erase boards down to group. We work through the curriculum together, just at different paces and different levels of scaffolding. When I’m working with one of the groups, the other group is on Technology. We have students computers and a small group set of ” target=”_blank” rel=”noopener”>Kindle Fires I got through a grant so students are further split in half and go to one of these. They rotate between the two each day; so one day they’re on the computer and the next their on a Fire. This time is important to me as well since it’s a big chunk of time. I wanted students to stay engaged and really be furthering their knowledge. They are usually Freckle or Moby Max but occasionally I’ll throw in something different to keep their excitement up. These two websites allow you to assign specific skills/standards and also allow students to practice on their individual levels. With Freckle, I love that I can have students work within the domain that we’re practicing but working at THEIR level. I would tell students to practice a specific standard from time to time, but often they’d work where they need to work, and with my low group it’s been great to know that they’re practicing those skills that need to be cleaned up. To see more about Front Row, click the image below to head to that post. I often use our Rocket Math program during this time but we also play fact games as well. My students absolute favorite way is to play 5 in a Row. They beg to play each day. Click the image below to head to my blog post to see more about the game and how it’s played. You can also check out all of my 5 in a Row items in my TpT store. I do a daily spiral math review every morning as part of our morning work outside of our math block. I like to do this sort of system because it gives students a chance to work through all of the standards several times a year and gives students practice on various standards each day. We do one set of the previous year (40 pages so that makes it through about the first quarter of the year) and then do three sets of the current year throughout the year. I have spiral review sets for 1st, 2nd, and 3rd grades. You can click any of the images below to head to my TpT store to check them out. I hope you’ve enjoyed taking a walk through our math block. For other math posts you can click the images and links below. Thank you for sharing this information! I planned to try out guided math with my 4th graders this year, but I’m going to consider this approach as well. We have 70 minutes for math, so I want the time we have to be productive. While you’re meeting with one group, is the other group always working online or do you have them work on other activities as well? Usually I have them working online for that 20 minutes. I do, though, often have them do an independent task to turn in (like an exit ticket or worksheet) to check to see how they’re performing independently. That usually only takes a few minutes and then they go begin their tech task. What do you have the other group do while you are teaching the small group? I have been trying to find a way to do this, and I really like the way you do it! Do you have centers for the other group? How do you plan the time for the other group during those centers? Usually I have them working online for that 20 minutes. I mentioned it above but I’ll edit my post to be a little more clear. I do, though, often have them do an independent task to turn in (like an exit ticket or worksheet) to check to see how they’re performing independently. That usually only takes a few minutes and then they go begin their tech task. Thank you for sharing! I also do ninety minute blocks, and I struggled with how to effectively use this time. I absolutely love your ideas!! I did not do a good job with problem-solving this year, so I love how you start your day with this, every single day. I can’t wait to implement your ideas next school year! My first year in third grade, the day we took our math test during state testing, I literally felt so disappointed in myself because I knew I had not prepared my kids enough for the problem solving expectations. We did it, don’t get me wrong, but I knew it was not enough. Daily problem solving began immediately and I’ve seen its benefits in the years that have followed. I like this idea a lot. I’m departmentalized so I’m thinking of this in my head. What is group 2 doing while you work with group 1 and vice versa? Thank you for sharing your experiences and your ideas. I am a grade 4 teacher who has been experimenting with math centers this past year. In our school we have math groups so that makes things a lot easier in some ways. However, I so like the ideas that you have presented and look forward to trying them this year. I think small group time is so important for me to really know how my kids are doing. But when I realized I could do that with this method and not necessarily have to do a bunch of centers, I loved it. I also have read many things and tried many things to make math stations work, I love your approach and think it could work well for me. How do you get grades? Do they do an independent assignment during your small group lesson time? I do most of my grades based on assessments, as I want my grades to reflect what students are able to do after I’ve taught. With that said, I do include some classwork grades. I would occasionally give students some seat work to do independently to turn in to show how they were able to do on a skill. Sometimes this was in the form of a quick exit ticket, and sometimes it was just a worksheet. The days they did that, they’d do it and turn it in and then head to their tech center. Or, if they were the second group, they’d do it and turn it in and do a fast finisher type activity while they waited for us to move on. I don’t understand what you mean by second group. Is this your Group 2 students? Also what do u mean by fast finisher type activity while they waited for you to move on? Yes, by second group I mean group 2. And for fast finishers, I have a few different math activities that are available for students to do if they finish early. Hot Dots are a favorite. Do you use the grouping every day? Do you teach the all of the lessons in the groups as well? I’m a bit confused with the quick review of the previous lesson. I do the grouping this way nearly every day, but there are some concepts it’s just quicker and easier to do whole group, especially if we’re doing a project. For example, when I introduce fractions I always do it whole group as we work through folding construction paper and identifying the fractions. As for my comment on reviewing the previous day’s lesson, I mean just that; the lesson from yesterday. I have experienced all of the same frustrations and disappointments in my attempts to get my math block structured in a way that I feel really good about. I do large group instruction well, but want more small group time, without the struggle of preparing meaningful centers all year long. I think this is the answer! I know myself, and my strengths and weaknesses, well, and I believe this will work great for me! How do you determine your groups? Do you pretest before each unit? I determine my groups based on the beginning of the year assessment, and then my ongoing observation and assessment data. I don’t do it in relation to a specific unit. I am so glad I stumbled upon this article! I teach third grade math, science, and social studies. This will be my second year of teaching. Last year, I tried all different kinds of grouping routines and never really did find what I was really looking for. I am excited to try this method during my math block. I feel it will me the answer to accelerating for the gifted students and remediating for the lower students. I am curious to know though, do you or what type of math homework do you give students? Also if you do assign homework, how do you go about checking it? Thanks so much! I am so happy to see that you split your class during math! I have a nearly identical schedule that I use – half working on technology, half in a lesson with me. I love that I get to see my students understanding of the lesson more closely. I do have a question for you. Has your principal asked why you split the class this way? My principal has and I tell her that I get a better understanding of what my students can do mathematically and can provide better interventions, but I don’t think she is satisfied with my explanation. Do you have advice for class visitors who wonder about the split lesson structure? My principal this past year was confused when I told him that I didn’t really have worksheets or paperwork that I gave to students during their math time when I had a student in the office. I tried explaining it and I don’t think it went over well. However, I then had him come in and observe during that time and when he saw it in action he was impressed. We were able to talk about my plan beforehand, and he saw first hand I was able to push my higher kids and give my lower kids more support. After seeing it, he really understood why I did it and saw that it worked for us. Love this. It’ll be my 2nd year teaching 2nd and I have to change my math block. Do you meet with each group each day? I only have 60 minutes for math, can you provide suggestions on how best to modify what you do to fit it a 60 minute block? I do meet with each group daily. That was one of the most important and exciting things about this framework to me. If you only have 60 minutes, I’d probably recommend making your group times more like 12-15 minutes. That would leave you 30 minutes for problem solving, number sense, etc. You could even introduce the lesson before you went to group leaving the group time for guided practice. I love that idea!! I am so going to use it!! I teach third grade too and this year I will be part of an adaptive math pilot. We will each get I pads for half of the classroom. We have to use STAR math, and ST math. I also really like Moby Max.This model makes sense to me. I like not having to prep centers all the time! I was just wondering, do the kids stay engaged in the computers? I find that the novelty of technology starts to wear off mid year. Do the students get to do hands on activities with you? I try to change up what they’re doing online and that helps keep them engaged. Sometimes I’ll give them free choice on a couple different websites and just that little change keeps them engaged. For the most part, yes, they do stay engaged in what they’re doing. As far as hands on activities, yes, they do. If it’s something that’s best taught in a hands-on way, I might teach that day as a whole class walking everyone through it. For example, I do that when introducing fractions and equivalent fractions. We begin using circles and rectangle strips and investigating what happens as we fold it. Because we do it step by step, I teach whole group that day instead. I teach a combination 2nd and 3rd grade class. Any ideas of how I can structure this to work with my two grade levels? Can I ask what math series your school uses in 3rd grade? How do you administer assessments, whole group or small group? Do you use assessments provided by the series, or do you create your own? We’ve used Everyday Math, but we’re getting a new series this year. My district created new assessments so we used those, but no, I do not administer them in small groups because they don’t need my attention as they do during the lesson. longer than 15 minutes so you have to still time from something else at least one day a week. Depending on what the agenda is for our school, I get to see at least two groups a day and focus on needs. I found it more beneficial when the lesson is introduced during whole group then I go around from student to student identifying students who were struggling with the concept or skill. That’s how I got my small/flexible groups! Groups may never be the same all of the time! Assessments are given at this time as well! However one thing that was very challenging …managing students who left me to practice the skill! I needed students to be more accountable???! Yes students worked on choice boards for the week/2 weeks at a time/assignments were graded/ students also focused on games and assignments on google classroom! I always had to be prepared. But I prayed and I made it to the end of the school year! ?????????. I love this approach! I’d like to try it in my 2nd grade classroom. Do you have a 2nd Grade bundle for story problems? I only saw a few individual months in TpT. Thanks! I’m working on getting the rest of the bundle finished, but it’s not quite there yet. I hope to have it done in the next few weeks! This is exactly what I have been doing in my 3rd grade class for the last 2 years and I love it. This year I will be teaching a 3/4 class and I said yes because I was so used to working with 2 groups that I thought I would be up for the challenge. The websites I use for the technology part are xtramath.com (math facts), TenMarks.com and Accelerated Math through Renaissance (our school has a license). There are days when we do whole group because of scheduling. This was an incredible resource! Thank you for the details! I teach fifth grade, so I’m wondering what we could do in place of the number of the day. Maybe we could use it with a well planned fifth grade resource. Any suggestions? I attended the webinar on this topic last week and we ended up having tons of technical difficulties to the point where I left the session early. I was and am still very saddened by this because I’m extremely interested in utilizing your techniques to strengthen my math block for this upcoming school year. Was the webinar recorded and if so, is it available for us to view now? I really like your explanation of how you split the block- quick question- do you give notes and have students fill them out when you teach the standard to half the class? No, I don’t do notes. I have the students working through the problems along the way. I do very little lecturing or explaining myself. This sounds amazing! I do centers right now and just matter how many times I’ve set expectations, modeled, redirected, etc. the students in the centers are still off task and lot getting quality practice during that time. Do you have any suggestions for what the other half of the class could do if there aren’t enough devices to have half in tech? I started a Donors Choose page to raise money for some more devices, but I was wondering if you had any suggestions for other activities. Thank you so much! The reason I use tech as my other half is because it keeps them engaged pretty well. You could have students do an independent skill review like a spiral or a warm up at their seats. I find my students are more productive at their seats so sometimes just bringing things to their seats helps them stay quiet and focused since they don’t have their peers. So, at times I would still do centers type activities but just independently. I have been teaching for 5 years and next year will be my second year in second grade. I have never seen a rotation schedule like yours, but it makes complete sense and I think it could really make an impact (so long as the principal okays it). I teach in a low performing school so I was wondering if you think rotating between number talk and math fact practice to create some extra time to pull students for intervention or one on one support could work? I am also curious about what you use for assessments (we have curriculum benchmarks) and what your math block looks like on the days that assessments are given? 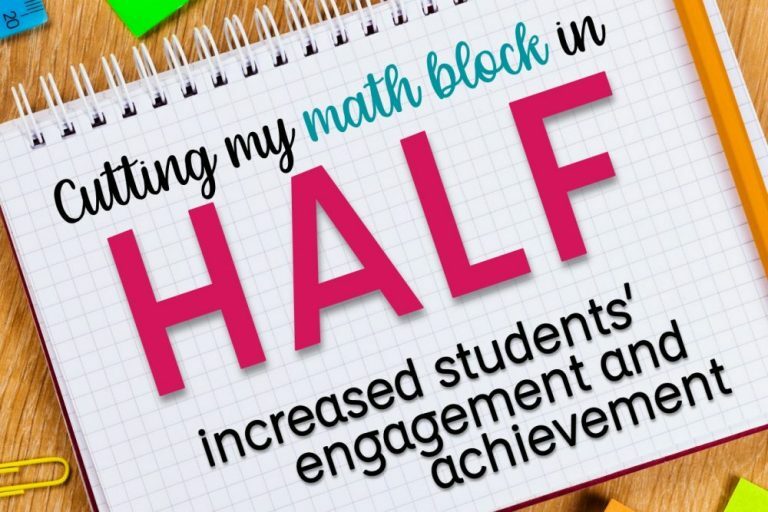 Do you think it would be that big of an impact to alternate (or tie in) math facts to the number of the day that way there is additional time allotted to work one on one with students needing more support? Also what does your schedule look like on days when assessments are given and what do your assessments look like (we have curriculum benchmark assessments) – how do these assessments impact meeting with your groups and completing the ‘normal’ routine? When I do number of the day students are generally still receiving math fact practice as they are using their facts to help them find ways to make the number. I keep my fact time separate to ensure students are receiving practice in both. If you needed the time and decided to alternate the days I think it’d be fine. I’m not sure how that gives additional time for one on one though, so I must not be visualizing what you’re saying. My assessments are generally given on Fridays and students transition to something else when they’re completed. Depending on the length of the assessment, I may tell them to go to their center for the day. I’ve even had students do the assessment during their “me” time and then I’m walking around and giving encouragement. I don’t have a set way, and have just done what I thought was best for that particular assessment. Can you give more information on the technology you use? Do the programs you use cost? How do use set the skill taught? Can the students work on the same skill that you teach that day? Does it take a lot of time to set up the technology for that day of teaching skill?? I absolutely love your ideas. It’s so much better than spending tons of time creating centers and games. I can’t tell you how much I appreciate you sharing your ideas. I teach 5th grade so I will look on TPT for similar warm-ups. Thank you so much!!! I use Moby Max and Front Row the most. Both have paid versions. For Front Row, I use the free version. I generally have students working on their individualized path practicing the skills they need in a specific domain, but I’ve also assigned specific lessons to practice the skills they are lacking in. There’s validity in both types of thinking. I’ve also heard good things about Prodigy for free online practice. Thank you for this post! I am going back to teaching 3rd after doing 4th grade ELA for a year. I have been searching for how to make my math block work. Like you, the guided math posts always sounded great, but I could never make it work just right for me! I am wondering, truly, if you have seen consistently better results this way? I also have about 60 minutes for math, so I am trying to figure out how to get it all in. The answer is that I probably can’t 🙂 This sounds great! Yes, I absolutely have seen better results this way. I’m better able to meet my students at their individual needs and really notice their mistakes and missteps early. I am so glad to see this post! I felt the same way about my kinder math block… my kiddos were not engaged and I felt like ideas doing them a disservice with the centers/rotations! until I thought of a system like this! It has worked wonders. I can’t wait to try this again this year! Do you have a curriculum or math book you follow? We have a math book and we are expected to do a math lesson a day from the book. So, how do you make that work with this set up? I have been trying to find a center set up that works for me. I have been struggling. When I wrote this post I was not mandated to use my math curriculum, but I now am. I work through the lesson within the small groups. My high group goes through it more quickly and I can still enrich them a bit. My lower group does not complete it all and we work through it much more slowly and with more scaffolding. I am limited to 3 computers in my classroom. So having my groups on tech would be difficult. I could rotate them through and have another center. But what would you suggest? I like the tech center because I don’t have to explain directions very much- just basically if they’re working in a specific domain or not. You could do partner games or a hands-on center where students are exploring pattern blocks, geo boards, base 10 blocks etc. depending on your grade. I have felt the same exact way about my math block with centers and rotations. After our reading block I am tired and trying to make 3 math groups work in our short amount of time I was disappointed and frustrated. I am so excited to try this out and see how my kids begin to grow! Also, I love the layout of your math block and how you incorporate a lot of number sense activities! Thank you, thank you, thank you! I hope it works well for you and your students!